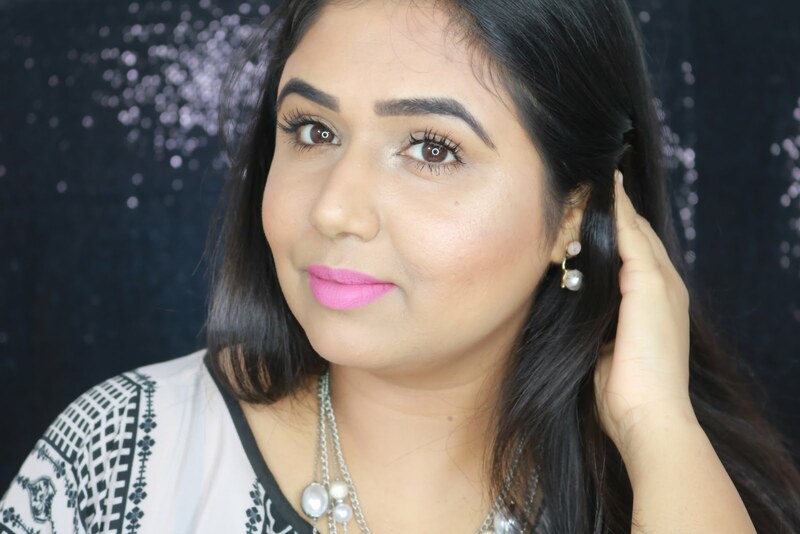 I love n*de shades and MLBB kind shades for every day wear but slowly I have been venturing out to bright shades and one such shade which I absolutely love is Rimmel Lasting Finish Lipstick in the shade 085 Royalty. Rimmel London Lasting Finish Lipsticks come in quite attractive packaging, I really like the deep burgundy shade of the bullet and their logo imprinted on the cap adds cherry on top! The lipstick contains 4g of product which is fairly decent quantity. The shade Royalty is stunning bold pink with strong purple undertones! I absolutely love this shade especially on warm undertones it looks very flattering! Though I love MLBB shades a lot I don't like shades with warm peachy brown undertones much since they don't add any value to my whole face, rather I like lipsticks with pink/purple/blue undertones since they add a pop of color and instantly brighten the entire face and the shade Royalty is definitely one of them! The texture of the lipstick is smooth and creamy and glides on lips effortlessly. It settles to a semi matte finish which I absolutely love. It feels light weight on the lips and is not sticky at all. Pigmentation as you can see is amazing and you get full opacity of color in a single swipe. The lasting power is equally good, it stays on my lips for 5 to 6 hours easily with in between meals, even after that it gives a mild pinkish purple stain on the lips which I personally quite like. I usually apply a coat of lipstick and blot it and reapply a coat, this way it stays on my lips for almost the whole day and does not feel drying at all. It does not bleed or settle in fine lines like some of semi matte texture lipsticks do. Overall a fantastic lipstick and I highly recommend this shade! I love love this shade a lot and would definitely recommend it to everyone! Hope the review was helpful, until next time take care and stay beautiful! Lovely shade, looks good on u! This shade rocks on you..
Nice shade it is:) Lovely FOTD!!! I love Rimmel lipsticks (: this one reminds me of Mac Chatterbox on your lips ! Suits u so well Pari! these lippies r superb value fr money na..
totally agree! for the price its awesome! Thank you so much Manisha!